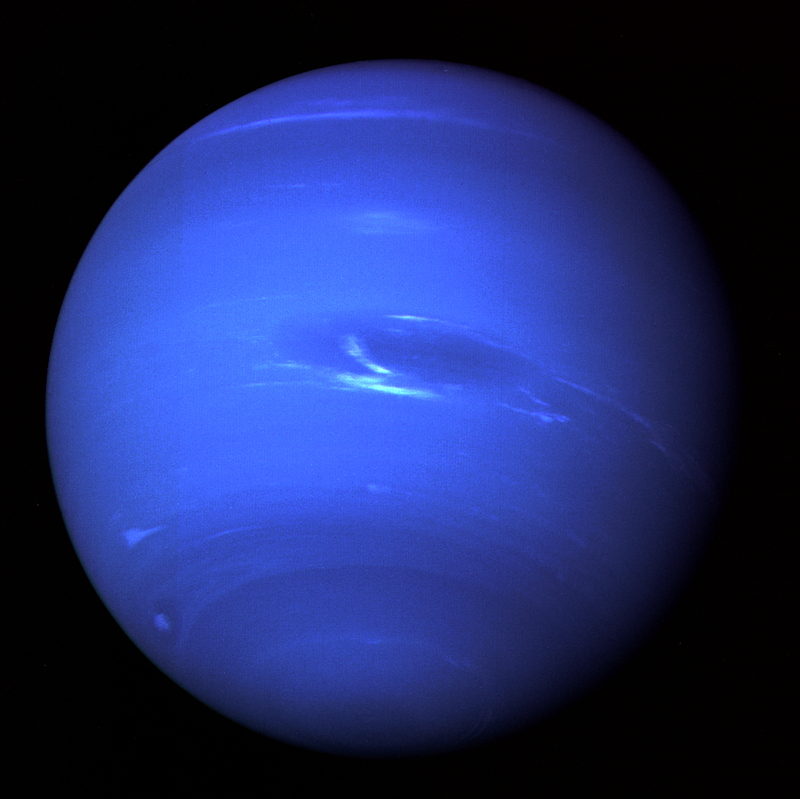 Neptune’s blue colour is the result of methane in its atmosphere. It is a giant planet composed chiefly of gas and ice. The planet’s tilt is similar to Earth’s, which means it also has seasons, although each season lasts more than 40 years. 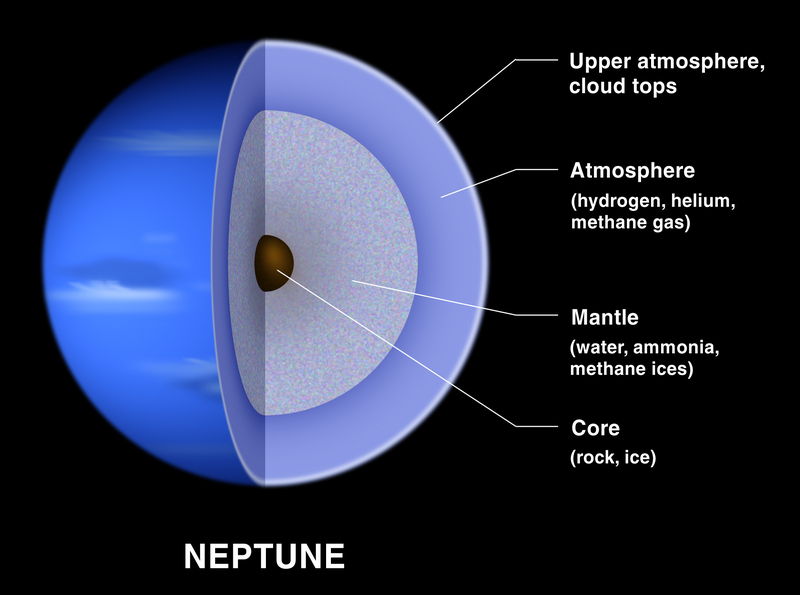 Neptune’s core is composed of silicates and iron, and the temperature at its centre is probably greater than 5,000°C. The core is thought to be floating in an ocean of liquid diamond. The core is surrounded by a hot and fluid mantle of water ice, ammonia and methane. It also contains a thin electrically charged liquid layer that is likely the source of Neptune’s magnetic field. The outer atmosphere is composed of hydrogen, helium and trace amounts of methane, with thick clouds, high winds blowing at speeds of up to 2,200 km/h and storms. 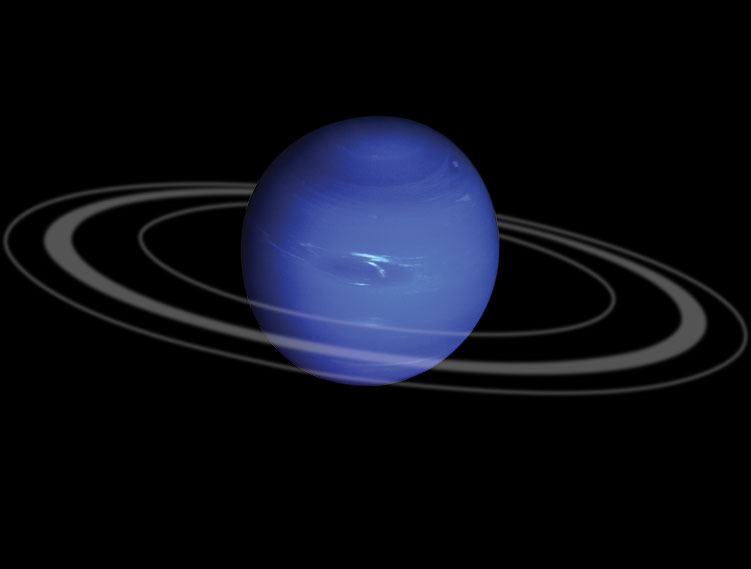 Neptune is also encircled by a system of 5 thin, darkish dust rings whose composition is unknown. The outermost of these rings, Adams, is in fact made up of arcs that were named Courage, Liberté, Egalité and Fraternité in honour of the French team that discovered them. Observations by the Voyager 2 probe and ground telescopes have enabled 14 moons to be identified. The largest of these moons, Triton, spans 2,700 km and makes up 99.7% of the system’s total mass. It moves in a retrograde orbit around Neptune, meaning it is a Kuiper belt object captured by the planet. Its trajectory is also unstable due to tidal effects. It is gradually spiralling towards Neptune and will likely break up when it reaches the Roche limit1. 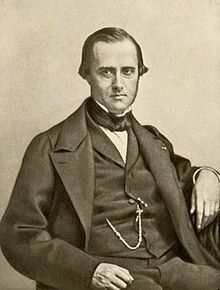 1 Edouard Roche was a 19th-century French astronomer who predicted that beyond a certain minimum distance from a planet, satellites would be torn apart by tidal forces. The rings of the giant planets in the solar system are beyond this limit, which explains why they can’t agglomerate into moons. Voyager 2 is currently the only spacecraft to have flown by Neptune. Launched on 20 August 1977, it flew past the planet on 25 August 1989. 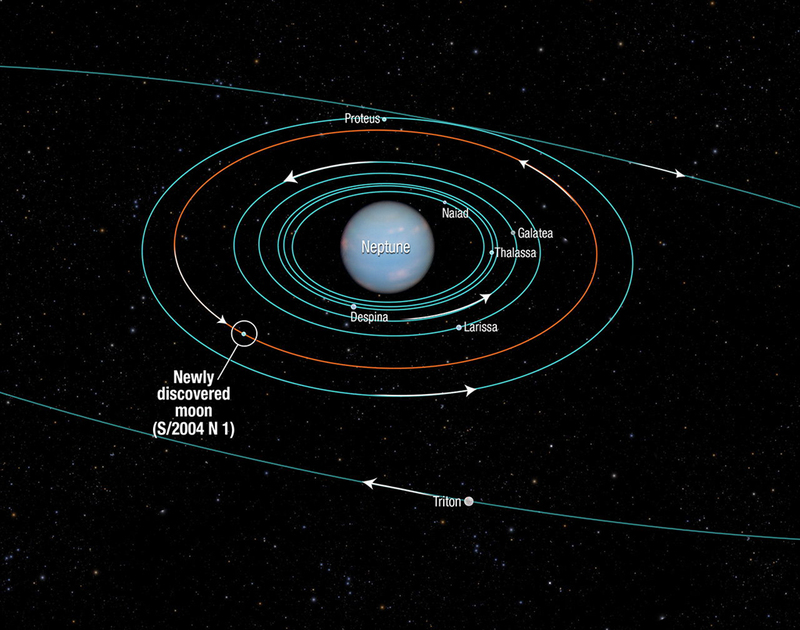 Most of what we know about Neptune today has been deduced from the data obtained by this mission. Orbits of Neptune’s main moons, from Voyager 2 data.